A patented modern executive desk which looks great in any high profile installation with it's striking features and splayed leg design. If you buy a Chrome table, you'll automatically be sent Chrome Legs and Chrome beams but particularly with XD2, when often the beams are obscured from view - many of our customers substitute the chrome beams for a painted white or silver beam, which brings down the cost quite considerably. Let us know if you wanted us to quote you on this variation? 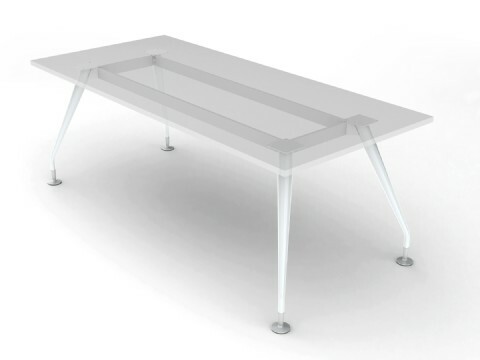 Our standard default combination generally would be Chrome legs & Chrome beams but bearing in mind the way this frame is designed, you're likely to have a substantial overhang on the top, obscuring the beams - you can substitute the Chrome beams for White or Silver, which would work out quite a bit less expensive! Please contact sales or use the livechat facility if you wanted to explore that option, as one of our sales team will be happy to put a quote together for you on this. Within the Technical Data tab, you'll also find some configuration layouts showing you what size frame you'd need to accommodate various top sizes, so this is also worth a look! We also offer huge range of desk accessories including Modesty panels & Screens, Cable Management solutions and Monitor arms which can be purchased along with the desk kits.